The following post was sponsored by Bernzomatic. The content and opinions expressed are all mine. 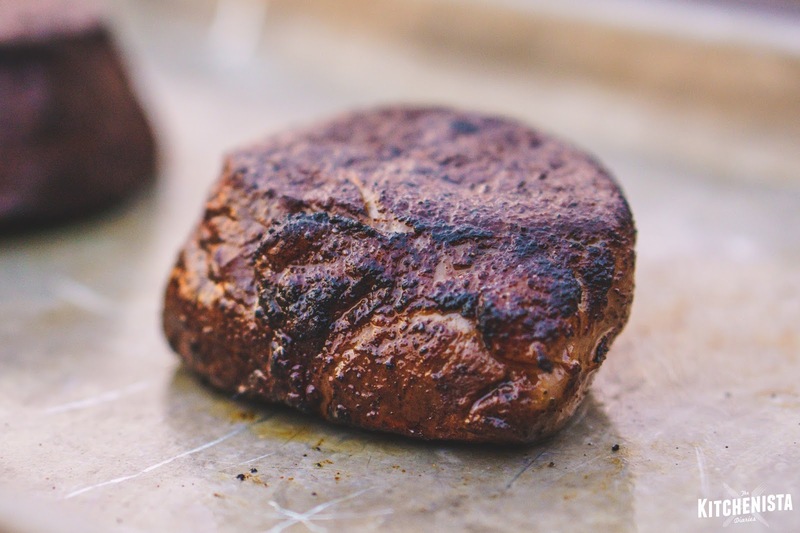 Filet mignon seems to be the go-to steak when folks want to get fancy on special occasions. It's an extremely tender cut. It's also very lean, lacking the marbling of fattier cuts of steak. 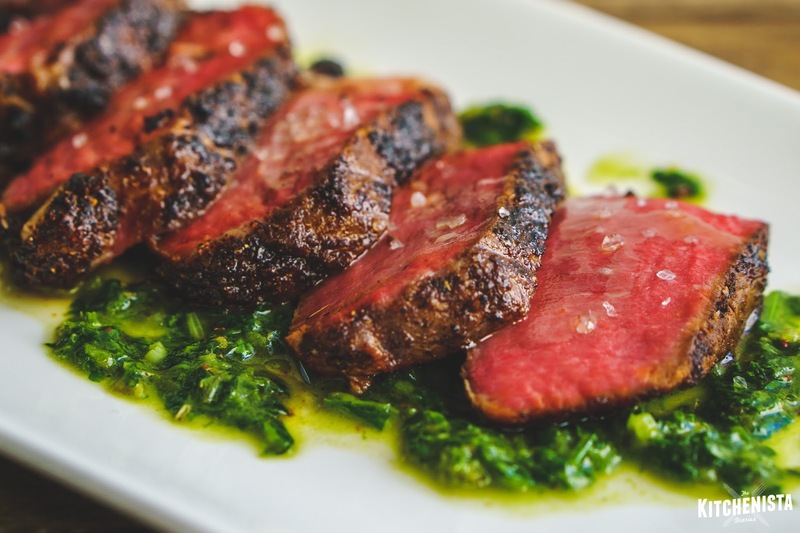 Now I'm not here to convince you one way or another on what the best cut is, but in my experience, there are far superior steaks (ahem, hanger steak) to choose before dropping $19/lb on tenderloin, even for upscale dinners. There. I said it. 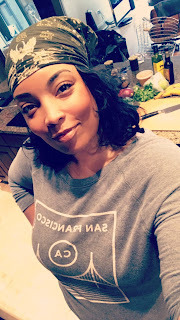 I feel better after speaking my truth before we proceed. 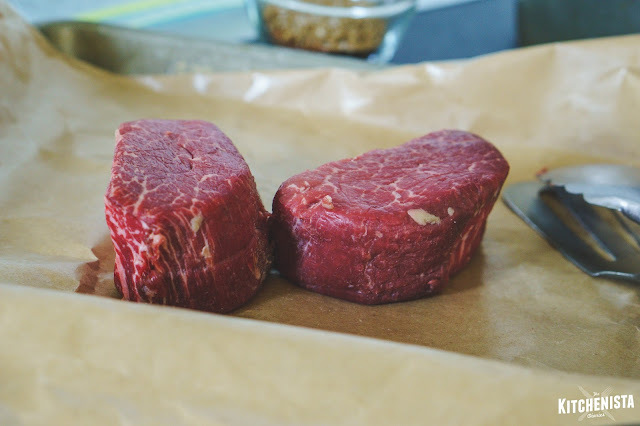 My personal feelings aside, I am often asked to prepare filet mignon by clients who are intentionally choosing a leaner and "less beefy" tasting steak. So with that I can assure you, yes you can most certainly incorporate steak into your meal plans and still keep it healthy. With that in mind, the one thing to know about filet mignon is that you absolutely can't overcook it or you'll be gnawing on leather all night. The leaner a steak is, you'll need to stay in the rare to medium rare temperature range. Beyond that, so much moisture will be lost that it's going to be detrimental to texture and flavor. This is why you often see filet mignon blanketed with hollandaise sauce or other creamy concoctions to bring some fat back into the mix. And while I will never turn down an excuse to overdose on butter, there are way more interesting and flavorful ways to compliment a steak. The most important issue at hand is not screwing up your pricey steak. First of all, now is not the time to get cheap. Go for the prime grade and/or aged steak if available. Better marbling, best texture and flavor. You'll need it. Be especially suspicious of choice grade filet mignon on sale around the holidays and at discounted grocers. In my experience it's not from the best beef and is often very bland, dry or even stringy. This is when you're honestly better off choosing another cut, like flank or New York Strip, which are still fairly lean albeit more marbled. What we have here are two issues to tackle. The first is preparing the filet mignon correctly so that it doesn't overcook. The second is serving it with a sauce that lets the meat shine but also won't monopolize your calories (or time) for the day. In my recent post, I shared how to get started when you're ready to dive into the world of sous vide cooking. Make sure you've read that one as a primer. In this post, I'd like to show you how I achieve a perfectly cooked steak utilizing my sous vide circulator paired with the Bernzomatic TS8000 Max Heat Torch. 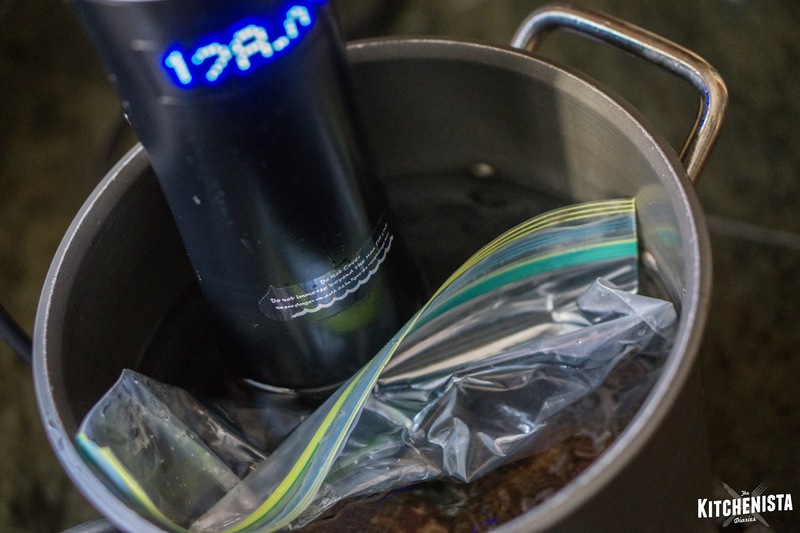 Sous vide cooking is the best thing that ever happened to home cooks attempting to prepare steaks at home. I find that many people are still resistant to incorporating meat thermometers into their routine which is a problem when you want to be precise (and safe) cooking a steak. With a sous vide circulator, you bypass all of that. It's the true "set it and forget it" technique of the 21st century. There's even tables all over the internet telling you exactly how long to cook your steak, and at what temperature, to achieve the results you want. Doesn't get much easier than that. Before you follow this recipe you'll at least need to be familiar with the way your circulator functions and have it set up in the proper vessel for water storage. 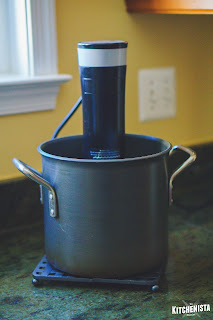 Today I used my Sansaire immersion circulator set in a large stock pot. It's a very basic setup and probably the one most of you are going to be doing at home. For other options, please refer to the previous tutorial. 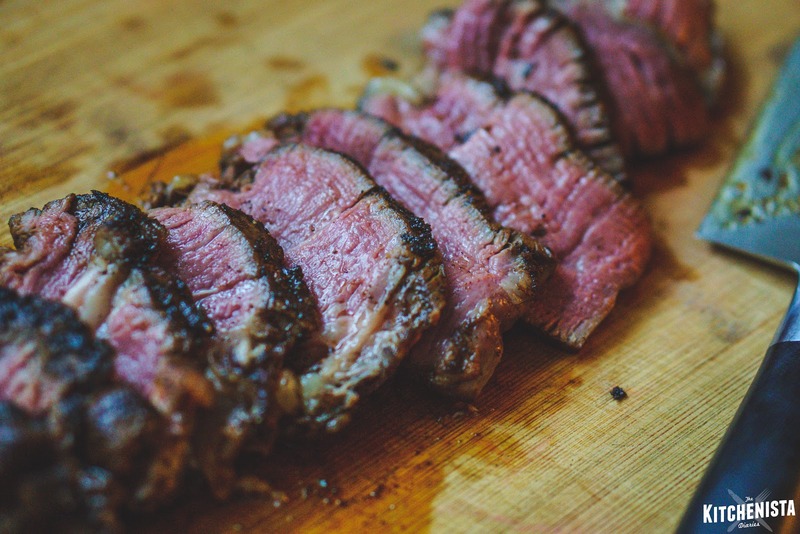 Sous vide cooking is especially useful for lean cuts like filet mignon because you want to get an evenly cooked rare to medium rare temperature all the way through the steak, without the bulls-eye of grayish overcooked meat around the perimeter. There's less fat in filet mignon and less of a safety net when you get to flipping it back and forth in a hot skillet. 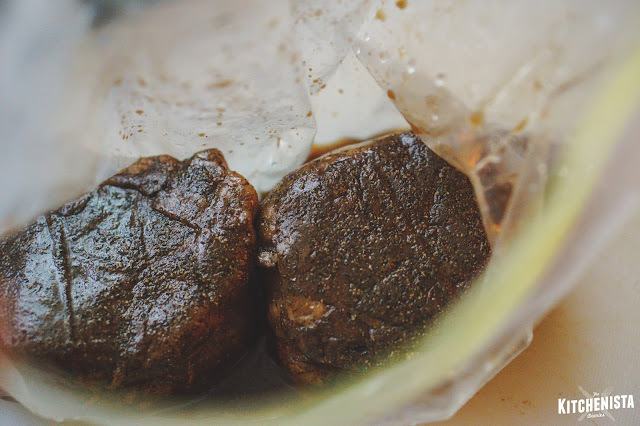 In a sous vide water bath, a one-inch thick filet mignon takes an hour to cook but you can hold it up to two and a half hours*, which is great if you need to coordinate dinner service. The only real downside to preparing steaks sous vide is that the surface of the steak gets pretty wet during the cooking process. Typically, you would finish the steak on a grill or searing hot skillet for just a minute or two. Perhaps even with a butter bath like the restaurant chefs do. All those things work, it's just that you are definitely at risk of overcooking the meat you took the time to get to a specific temperature. In the photo below, I did this recipe using my sous vide machine at 128°F and finished the steak with a butter bath in the cast iron skillet. It was pretty good, but as you can see there is a slight well-done ring around the edges of the meat, and the meat did start to go past rare as it approached center. A few months later, I redid a photoshoot for this recipe. The steak was cooked to the exact same temperature. This time, I seared it with my torch instead of in the pan. See the difference? 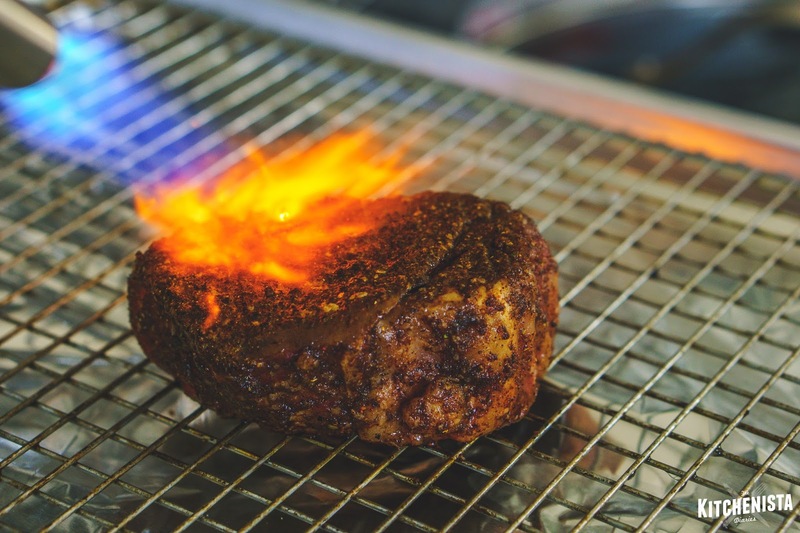 The torch applies heat so quickly to the outer surfaces of the steak that you can get a crusty sear within a matter of a few seconds. Not one spot was overcooked. (I also sprung for prime filet mignon here, illustrating my earlier point about the quality of the meat itself.) 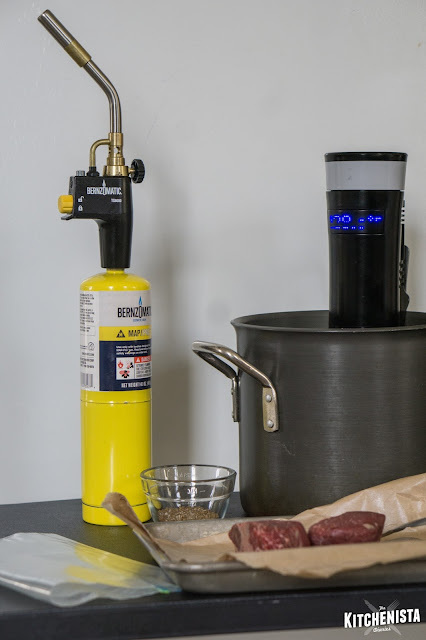 The sous vide + torch combo is the ultimate way to prepare a precisely cooked steak. That's definitely the sort of thing that should matter when you're going out of your way for special occasions. It's also just so mind-blowingly easy that there's no reason not to use this technique for any steak dinner. The best part is not even needing to turn your stove on! Here's a brief video of the sous vide and torch techniques in action! Now that you cooked your filet mignon to perfection, the remaining issue to deal with is dressing the finished steak with some sort of sauce that won't defeat the point of choosing a lean cut. This problem is fairly easy to fix. When in doubt I always turn to herb sauces made with a good olive oil for richness. They add a punch of bright flavor that compliments just about any meat, fish or vegetable. When I think of steak my mind immediately goes to chimichurri. It's a sauce of Argentine origin but oddly enough every Cuban restaurant I went to in Florida served it with skirt steak and a side of rice, beans and plantains. So that was always my point of reference. 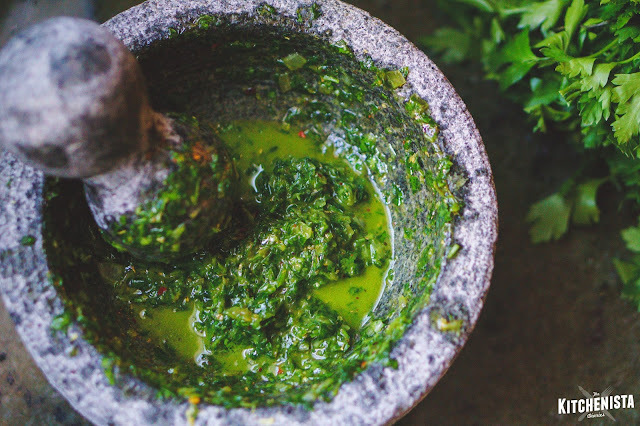 Classically the sauce is made with lots of fresh parsley and includes dried oregano, garlic, vinegar, and lots of good olive oil. It's easy to find variations and I have thrown this sauce together with almost any herb I happen to have on hand in there. On this particular day I was low on both parsley and cilantro (my default choices) so I used arugula instead. I love the bitterness of arugula and how tender the greens are. 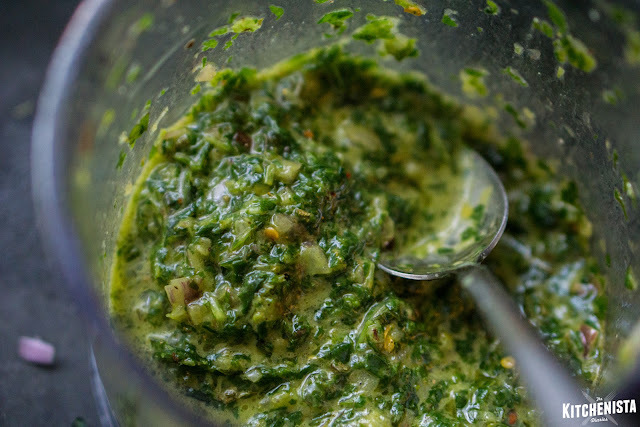 Since it works so well in pesto I wasn't surprised that it worked in a chimichurri sauce. The sauce comes together in minutes, so you can do that while the steak cooks. Leftovers are incredible over eggs the next day. (Or you could just make this recipe for breakfast in the first place. 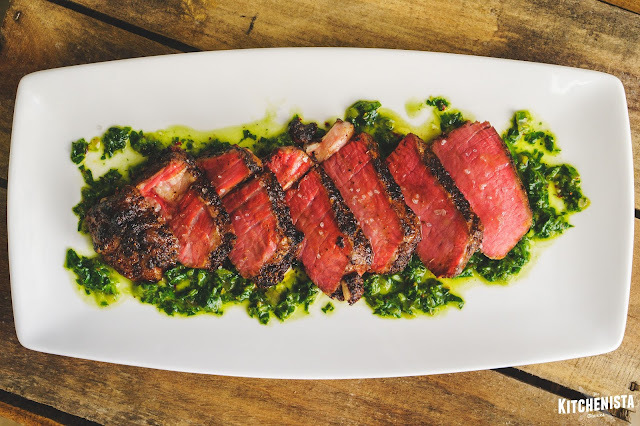 Serve the filet mignon and chimichurri with sunny side up eggs, which means you get that yummy yolk to dip your steak in as well. It's a win win.) All you need to know here is that chimichurri is a guilt free sauce. Drizzle it over everything with reckless abandon. 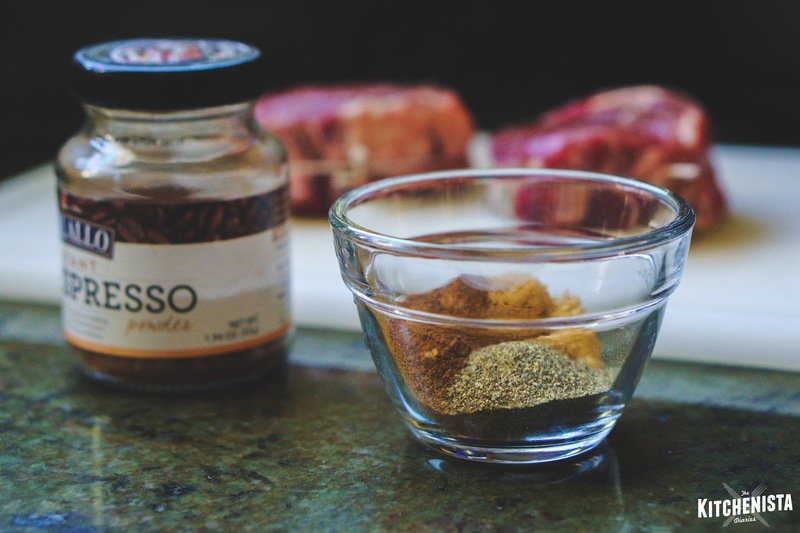 You might notice that I also seasoned my steaks in this recipe with a simple coffee rub. This is also the cheat code. Coffee enhances beefy flavors and really boosts color. 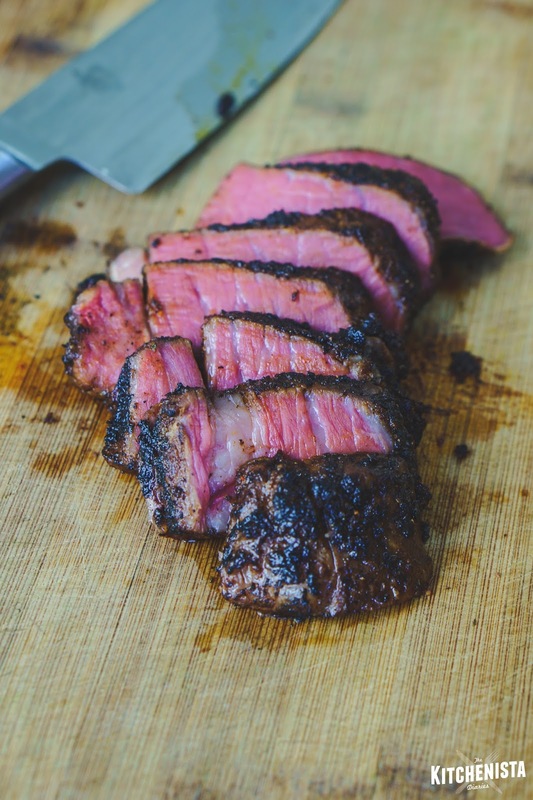 I've always loved a good coffee rub, but it also became a trick I turned to when searing sous vide steaks, because it makes up for the lack in color you're often left with. The little bit of brown sugar in the rub helps with caramelization when the steak gets torched. It's optional, so feel free to omit if you're not including sugar in your diet. Same for the honey in the chimichurri, which balances out the acidity and bitterness of the herbs. I often turn to this recipe when I'm on Whole30 and don't feel like it's missing much without. In summary, when dealing with lean cuts of steak, sous vide is definitely the way to go. 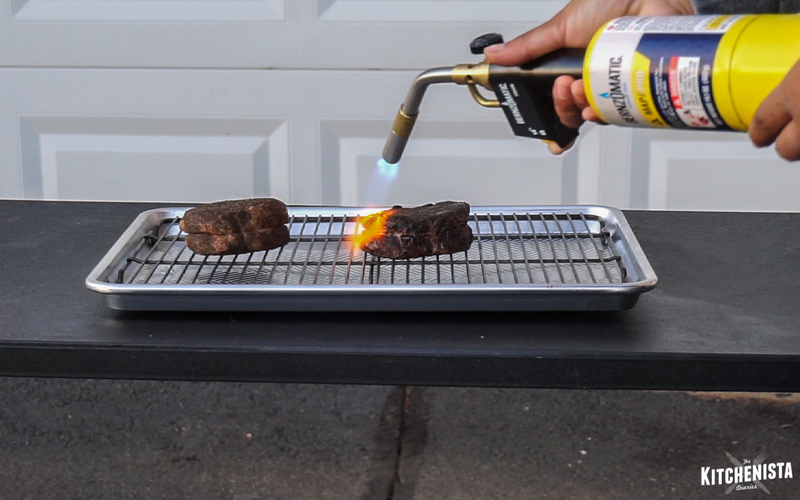 Finish it off with a torch like the Bernzomatic TS8000 to achieve the best sear without risking overcooked meat. 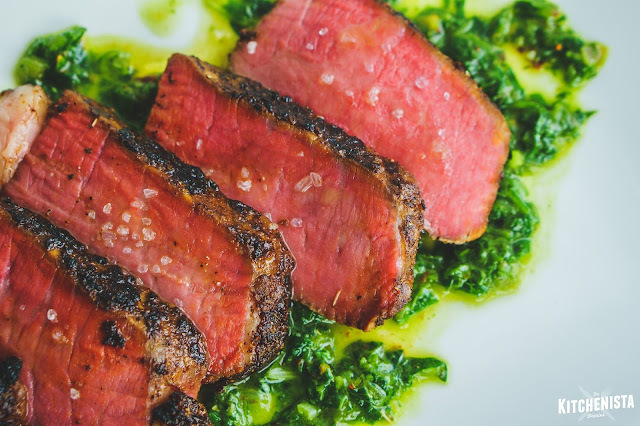 Pair the cooked steak with a bright, tangy chimichurri sauce to keep it healthy without sacrificing flavor. All three parts of this approach are outlined in the recipe steps below, and if filet mignon isn't your thing no worries. Use this recipe on your steak of choice, just adhere to suggested cook time and temperature with the sous vide portion of the process. 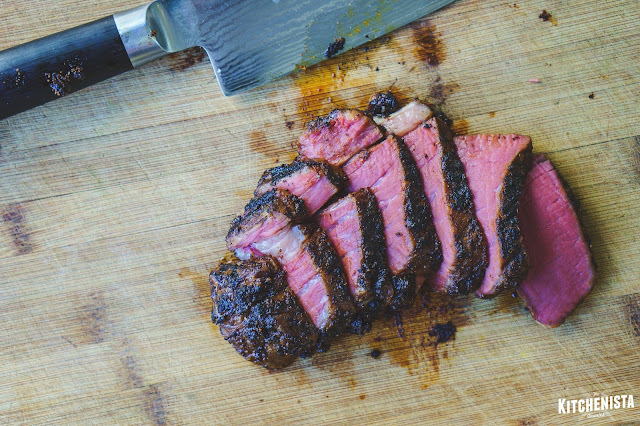 My absolute favorite cut is hanger steak, and this is exactly how I would still prepare it. Enjoy! Extra virgin olive oil to cover, approx 1/3 c.
Notes: To make this a Whole30 compliant dish, skip the brown sugar and honey. Make sure you read all other labels including the fish sauce. 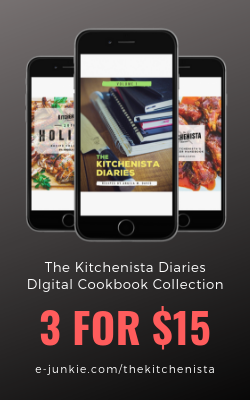 If you're a sous vide rookie, check out The Kitchenista's Guide to Getting Started with Sous Vide Cooking before you begin. Turn on your sous vide circulator per manufacturer's instructions, setting the water temperature for your preferred steak finish. For filet mignon, I recommend around 125°F for rare, up to no more than 134° for the upper range of medium rare. In the example here, my steak was cooked to 128°F. Mix together the salt, coffee, pepper, brown sugar and paprika. Season steaks on all sides. 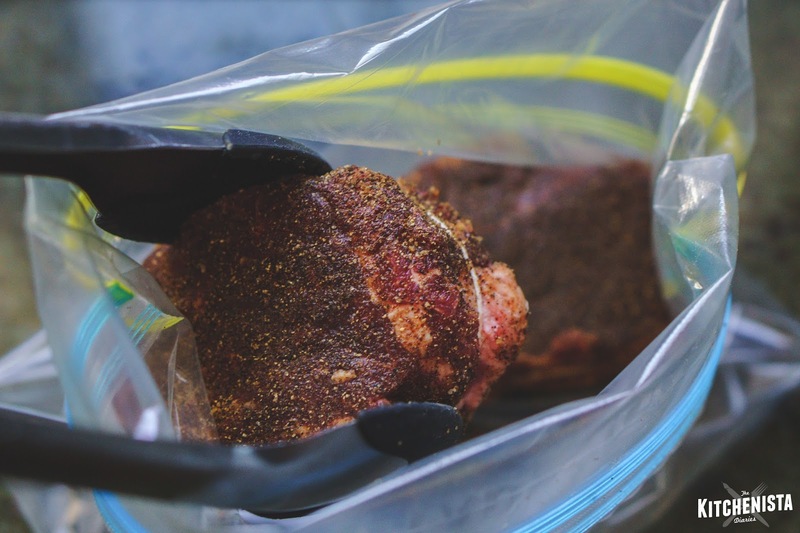 After seasoning, transfer steaks to a freezer safe zip bag or vacuum sealed bag. Wait for the water to reach the desired temperature setting before placing the steaks in the water. If using a plastic zip bag, leave it partially unsealed. Holding the unsealed end of the bag above water, submerge the rest of the bag under water to push air out before sealing completely. For temperatures up to 130°F, cook the steaks at least one hour or up to two and a half hours if you need to hold them longer. For temperatures beyond 130°F, you can hold the steaks up to four hours safely. Combine arugula, herbs, shallot, garlic, lemon, vinegar, fish sauce, honey and pepper flakes in food processor. Pulse until finely minced. Stir in enough olive oil to cover herbs and season to taste with salt & pepper. Set aside until needed to let flavors meld. The fish sauce adds a little umami, which will also enhance the meatiness of the steak. If you don't already have it on hand, try soy sauce instead. Alternatively, you can utilize a large mortar and pestle for better texture, because it does not tear the herbs so harshly. This is my preferred way to make herb sauces when possible. Start by grinding the arugula, herbs, shallot and garlic until it's all mashed together, and the greens are silky. It helps to add a pinch of salt and drizzle of olive oil at this step. Stir in all remaining ingredients, with olive oil to cover the herbs. Season to taste with salt and pepper. Once steaks are cooked, remove from water bath and transfer to a rack set over a heavy baking pan, or similar heat safe setup. Pat dry. The next step should be done in a well-ventilated area and only on a surface that can withstand high heat. Holding the torch three to four inches above the steak, torch the surface and sides to achieve a crusty finish. Move the torch so the flame reaches evenly across the surface without charring one spot too much. Use tongs to flip the steak over and torch the other side. Repeat with the second steak. You'll notice I didn't add any oil or butter during the cooking process. I tested it both ways and thought that it created a slightly acrid taste due to the intensity of the flame. If you really wanted to incorporate butter, just brush the steaks with melted butter after torching. Transfer seared steaks to a cutting board. Slice against the grain. 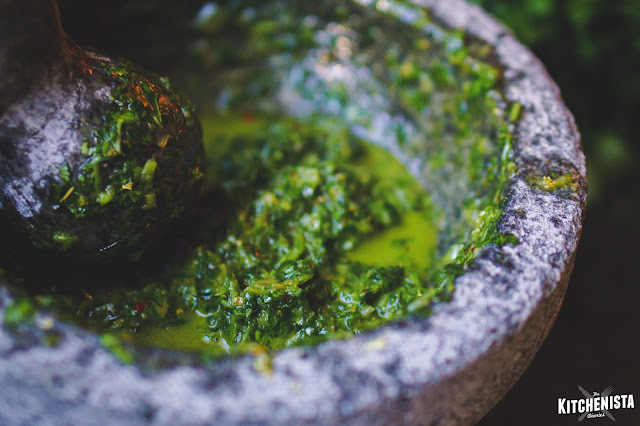 To plate, spoon some of the chimichurri sauce on a plate or serving platter. 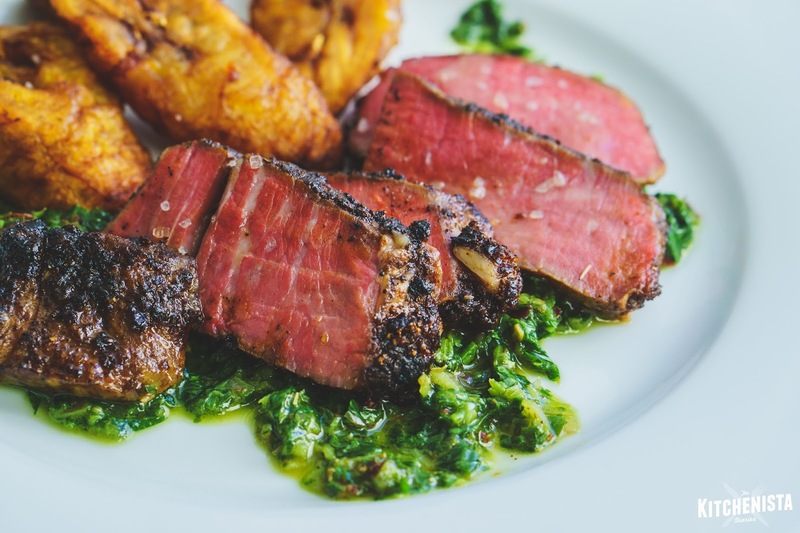 Fan the steak slices over the chimichurri. Drizzle with olive oil and sprinkle with a tiny pinch of finishing salt (or Kosher salt if nothing else.) Serve with additional chimichurri sauce on the side. I finished off this meal with a salad and side of crispy pan-fried plantains. Roasted potatoes, boiled yucca or even mashed cauliflower would also be an excellent fit, as would rice and black beans.